The Cycle P is a great training partner with a long durability due to its maximum user weight of 130 kg. You get a smooth concentric run and a comfortable and joint-gentle training thanks to the electrically adjustable magnetic brake and a balance mass of nine kg. The LCD display informs you continuously about all important training data. Learn your progress by means of measuring of time, distance, and calory consumption. You have an overview about 12 training programmes and 16 resistance levels, so that a great motivation is given as well. Choose either the integrated hand pulse sensors or an optional earclip for pulse measuring. Though it is recommended to use a chest strap, because it measures the most effectively. If you leave your set pulse limit, the computer gives a visual and an acoustic signal. Set your own objectives with the target zone training and improve your motivation for sport and fitness continuously. Several persons can train with the Axos Cycle P and call data thanks to the four users memory. Transport wheels and a height levelling provide a flexible choice of the set-up place or a quick storing. 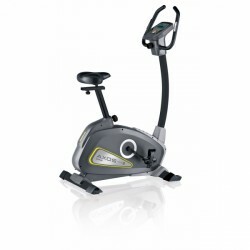 Kettler upright bike Axos Cycle P add to comparison list.